In 2005, Palla & Baraffe proposed that brown dwarfs and very low mass stars (less than 0.1 solar masses) may be unstable to radial oscillations during the pre-main-sequence deuterium burning phase. With associated oscillation periods of 1-4 hours, this potentially new class of pulsation offers unprecedented opportunities to probe the interiors and evolution of low-mass objects in the 1-15 million year age range. Furthermore, several previous reports of short-period variability have suggested that deuterium-burning pulsation is in fact at work in young clusters. For my dissertation, I developed a photometric monitoring campaign to search for low-amplitude periodic variability in young brown dwarfs and very low mass stars using meter-class telescopes from both the ground and space. The resulting high-precision, high-cadence time-series photometry targeted four young clusters and achieved sensitivity to periodic oscillations with photometric amplitudes down to several millimagnitudes. This unprecedented variability census probed timescales ranging from minutes to weeks in a sample of ~200 young, low-mass cluster members of IC 348, Sigma Orionis, Chamaeleon I, and Upper Scorpius. While I find a dearth of photometric periods under 10 hours, the campaign's high time resolution and precision have enabled detailed study of diverse light curve behavior in the clusters: rotational spot modulation, accretion signatures, and occultations by surrounding disk material. 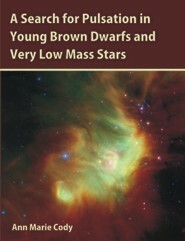 Analysis of the data has led to the establishment of a lower limit for the timescale of periodic photometric variability in young low-mass and substellar objects, an extension of the rotation period distribution to the brown dwarf regime, as well as insights into the connection between variability and circumstellar disks in the Sigma Orionis and Chamaeleon I clusters. Ann Marie Cody obtained her Bachelor's and Master's degrees in Astronomy & Astrophysics from Harvard University in 2003. She also attended the University of Cambridge as a Winston Churchill scholar in 2004, completing the M.Phil. degree in physics. Since receiving her Ph.D. from the California Institute of Technology in 2011, she carries out astronomy research as a postdoctoral scholar.